In today’s hustle-bustle world, most of us don’t have the time to take a luxurious bath all that often. Homeowners today are looking at how to bring more luxury and comfort into their everyday needs. That being said, GI Construction in Las Vegas are finding more home renovation requests for bathroom remodeling to include removing the tub and building a luxury high-end walk-in shower. There is something unique about walk-in showers–not only are they appealing from an aesthetic standpoint, but there is the feeling that reminds us of our stay at a luxury hotel. Just imagine being able to wake up each morning knowing you can step into your amazing walk-in shower and begin the day feeling energized and stress-free, ready to face the world! Now it is possible to have your own fabulous walk-in shower in the privacy and comfort of your own home. We have listed some of today’s top luxurious walk-in shower trends where capacious shower areas take center stage! If you’ve ever taken a warm shower outside in the summer–perhaps at a resort poolside or beach–you know that the sensation of having the combination of sunlight embracing you while showering is exhilarating. Obviously this isn’t something we are able to do every day, and either is counting on perfect bikini weather. But you can attain this same luxurious experience every day by having your Las Vegas contractor design and build a luxury shower with natural lighting. Nothing could be more soothing as well as more beautiful. Regardless of the dimensions, a window or two in a bathroom can make a huge difference in the overall feel of the room, and is especially beautiful if it is in the shower. For a natural light showering experience even more unique, you might consider a skylight for your shower room. The shower area will be saturated in natural light, displaying a heavenly effect! A walk-in shower doesn’t have to be designed with glass, tiles or marble to be luxurious. If you are someone that prefers organic natural beauty, you may consider using materials such as stone and wood to have a close-to-nature showering experience, while still maintaining the utmost spa-type luxury. Try a combination of materials such as stone or river stones on the floor and use wood as a decorative feature for your walls. It is best to go with tropical woods, like teak, ipe or massaranduba, which are naturally water resistant You can be sure to wind down with pleasure in this soothing shower setting. When it comes to bathroom remodeling, today’s homeowners are asking their general contractor to find ways to create more space. The frameless shower contributes to this goal, as it provides an open, airy feel, making the room feel larger. There is a seamless transition between shower and bathroom, and it is a wonderful way to show off tile work and other finishes. Keep in mind that the only option for shower glass isn’t just clear. You can choose from a variety of different colors that fit into your bathroom theme. Frameless showers are less likely to contribute to mold and mildew issues because they do not collect water. Also, they are usually treated with Diamon Fusion to help prevent water spots, making them easier to keep clean. 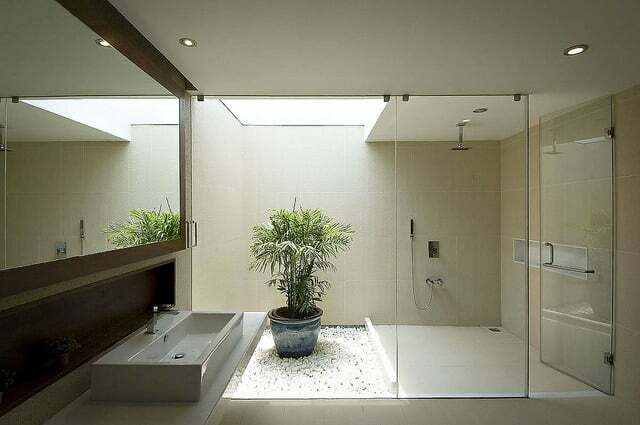 Most of us have been used to either showers encased in glass or tub/shower with shower curtain. However with today’s high-end shower interior designs in Las Vegas, you will see more open showers with no encasing, thus contributing to making the room feel more spacious and allowing for more versatility and visual aesthetics. Open showers are also becoming more popular in bathrooms that need to be accessible to everyone, and are definitely the perfect solution for anyone who has a physical disability. Construction companies in Las Vegas are finding installing a bathtub in the shower area is a growing trend in bathroom remodeling. It looks great, and if you have young kids that like to play and splash, there’s certainly no worry about water damage or mess. Additionally, if your tub design has a solid flat surround, it can double as a shower bench. Having your tub inside the shower room also leaves more space outside the bathing/showering area to get more creative with your bathroom design. This shower design gives you the best of both worlds. Imagine your shower having a full length pane of glass–not only letting you bathe in natural light, but allowing you to feel that you were outdoors under a waterfall! If you have the capability to design an area outside your house near the location of the bathroom, make a privately enclosed courtyard/garden that you can turn into your own paradise view. Install a rainshower and you’ve just been transported to the tropics. This showering experience would be amazing in the winter as well–imagine gazing out at a white winter wonderland while you are embraced by warm water as you bathe. Summon the rain at your fingertips by designing your shower area to include a rain shower. This showering technology is designed to give you the ultimate showering experience of a natural rain–whether it be a gentle rainfall or summer storm. This technology and ingenuity simulates rainfall down to the very last drop. A rain-free center zone allows for easy breathing while you are being immersed in a calm gentle rainfall. You can change up the degree of waterflow to emulate a cloudburst of rain, designed to rinse soap and shampoo. When it comes to bathroom remodeling in Las Vegas, this is the ultimate showering design that washes away all worries and stress letting you basque in the tranquility of your own personal rain shower! More and more homeowners are including a steam shower in their bathroom remodeling design. A steam shower is designed to release clouds of team before, during, or after your shower. Normally having this luxury would require a stay at a resort or spa, but now you can have your Las Vegas contractor design and install this indulgence in the privacy of your own home! Having a steam shower benefits your skin and sinuses and leaves you feeling refreshed. When you’re done steaming, just rinse off and you’re ready to go! Have you ever thought about doing yoga in your shower? Or how about just having a long bench to meditate and zen for awhile? 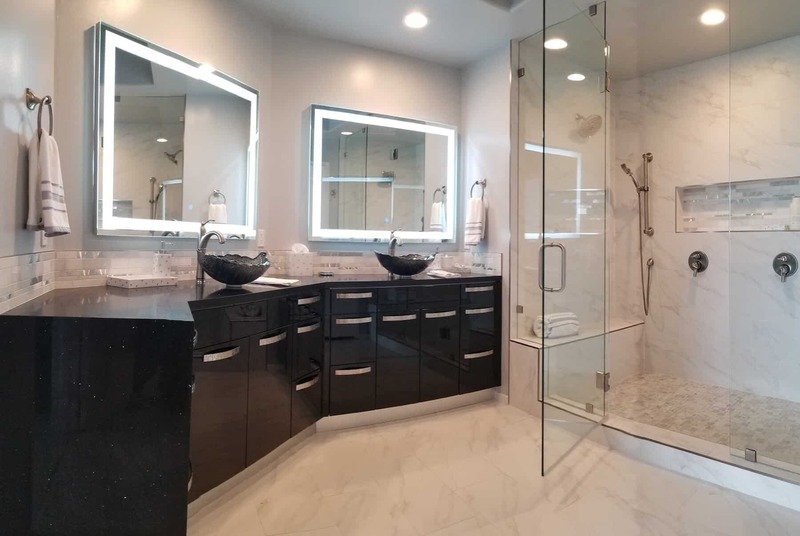 General contractors in Las Vegas are finding homeowners are requesting oversized walk-in showers to fit their bathroom remodeling needs. Oversized walk-in showers can also accommodate the tub (same as the “All-in-One” shower previously mentioned) as well as being the most accommodating for physically disabled. GI Construction can help you with your walk-in shower bathroom renovation in Las Vegas. When you are ready to say goodbye to your tub and explore all the possibilities of an amazing walk-in shower in your home, we are just a phone call away to get things started!. A member of our team will meet with you and discuss all your options. The project manager that will be assigned to you will assist you while you meet with vendors to help you decide what is the very best choice for your family’s needs. GI Construction have been creating beautiful luxury bathrooms for homeowners for years, who like you, would like to update their home and have something that will benefit them on a daily basis. By having a luxury walk-in shower, you’ll be able to enjoy a spa-like sanctuary every day that is your very own.